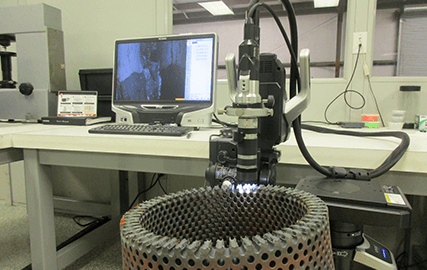 In March 2015, TEServices added a Keyence Digital Microscope VHX-5000 with XYZ motorized stage to increase their metallurgical evaluation equipment (stereo, light and scanning electron microscopes). This microscope has a better depth-of-field, resolution and brightness, multi-angle observation, dimensional measurement, 3D display and takes pictures in High-resolution HDR (High Dynamic Range). The digital microscope improves flat items (mounts) but is especially useful on items that have height differences (fracture surface). This addition is a further demonstration that TEServices is committed to increase the services to our customers.